The main difference between preganglionic and postganglionic neurons is that preganglionic neurons are the neurons that arise from the central nervous system and supply the ganglia whereas postganglionic neurons are the neurons that arise from the ganglia and supply the tissues. Preganglionic and postganglionic neurons are the two types of neurons that occur in the autonomic nervous system, which connects the central nervous system to the effective tissue. Furthermore, preganglionic neurons occur before the ganglion while the postganglionic neurons occur after the ganglion. Preganglionic neurons are the neurons that connect the central nervous system to the ganglia of the autonomic nervous system known as autonomic ganglia. The autonomic nervous system is a division of the peripheral nervous system responsible for regulating the functions of the internal organs. Also, the two main divisions of the autonomic nervous system are the sympathetic and parasympathetic nervous system. The sympathetic nervous system is responsible for regulating unconscious actions of the body while the parasympathetic nervous system is responsible for regulating unconscious actions at rest. However, both sympathetic and parasympathetic nervous system are made up of preganglionic neurons, autonomic ganglia, and postganglionic neurons. 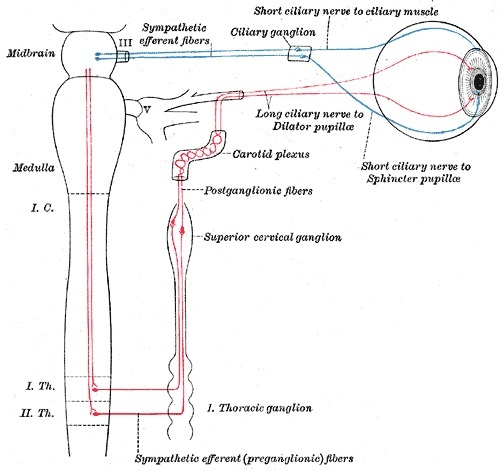 Furthermore, preganglionic neurons of the sympathetic and parasympathetic systems differ in their length of the axons. That means; the preganglionic neurons of the sympathetic nervous system are shorter when compared to the neurons of the parasympathetic nervous system. Also, these neurons of the sympathetic nervous system tend to form more synapses. However, both types of preganglionic neurons are cholinergic, which means they use acetylcholine as the neurotransmitter at the synapses. Moreover, preganglionic neurons whose cell bodies are located in the brain leaves the central nervous system as cranial nerves while preganglionic neurons whose cell bodies are located in the spinal cord leaves the central nervous system as spinal nerves. Postganglionic neurons are the neurons of the autonomic nervous system, synapsing with the preganglionic neurons at the autonomic ganglia. They are responsible for conveying nerve impulses from the preganglionic neurons to the effector organs. Moreover, postganglionic neurons of the sympathetic and parasympathetic nervous systems differ by means of the type of neurotransmitters they used. These neurons of the sympathetic nervous system are adrenergic, using noradrenaline as the neurotransmitter while the preganglionic neurons of the parasympathetic nervous system are cholinergic, using acetylcholine as the neurotransmitter. Furthermore, postganglionic neurons do not contain any structural component in the central nervous system and their cell bodies and dendrites occur in the autonomic ganglia. Significantly, the axons of the postganglionic neurons are not myelinated, reducing the speed of transmission of nerve impulses. 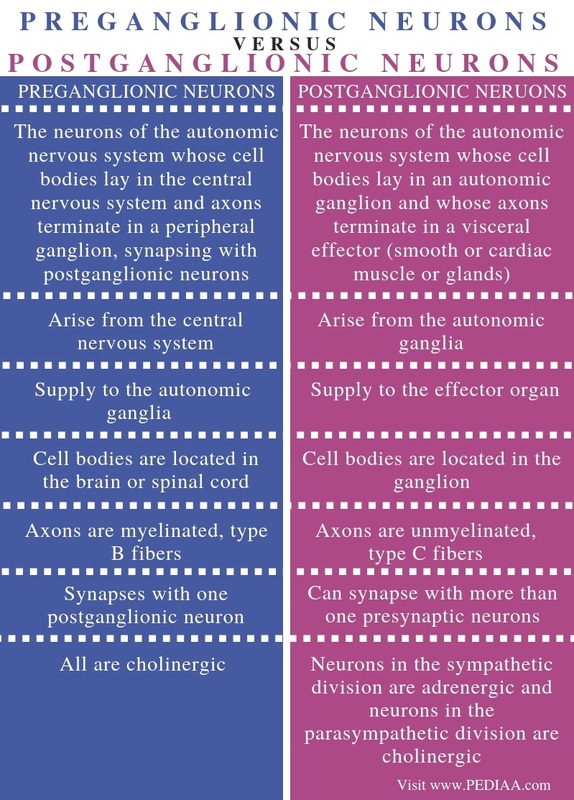 These are two types of neurons that occur in the autonomic nervous system. They have axons with a small diameter. Moreover, they are responsible for transmitting nerve impulses from the central nervous system to the effective organ. Preganglionic neurons refer to the neurons of the autonomic nervous system whose cell bodies lay in the central nervous system and axons terminate in a peripheral ganglion, synapsing with postganglionic neurons, while postganglionic neurons refer to the neurons of the autonomic nervous system whose cell bodies lay in an autonomic ganglion and whose axons terminate in a visceral effector (smooth or cardiac muscle or glands). Thus, this is the fundamental difference between preganglionic and postganglionic neurons. Their origin is a main difference between preganglionic and postganglionic neurons. Preganglionic neurons arise from the central nervous system while postganglionic neurons arise from the autonomic ganglia. Furthermore, an important difference between preganglionic and postganglionic neurons is that the preganglionic neurons supply to the ganglia of the autonomic nervous system while postganglionic neurons supply to the effector organ. Also, the cell bodies of the preganglionic neuron are located in the brain or spinal cord while the cell bodies of the postganglionic neuron are located in the ganglion. Moreover, another difference between preganglionic and postganglionic neurons is that the axons of the preganglionic neurons are myelinated, type B fibers while the axons of the postganglionic neurons are unmyelinated, type C fibers. A preganglionic neuron synapses with one postganglionic neuron while a postganglionic neuron can synapse with more than one presynaptic neurons. Hence, this another difference between preganglionic and postganglionic neurons. Besides, all preganglionic neurons are cholinergic while postganglionic neurons in the sympathetic division are adrenergic and postganglionic neurons in the parasympathetic division are cholinergic. Preganglionic neurons are the neurons of the autonomic nervous system, responsible for conveying nerve impulses from the central nervous system to the autonomic ganglia. Their cell bodies occur inside the central nervous system and they form cholinergic synapses with the postganglionic neurons at the autonomic ganglia. On the other hand, postganglionic neurons are the second type of neurons of the autonomic nervous system responsible for conveying nerve impulses from autonomic ganglia to the effector organs. Their cell bodies occur inside the autonomic ganglia. However, they form both cholinergic and adrenergic synapses based on the type of autonomic nervous system. Therefore, the main difference between preganglionic and postganglionic neurons is their location and function. 1. 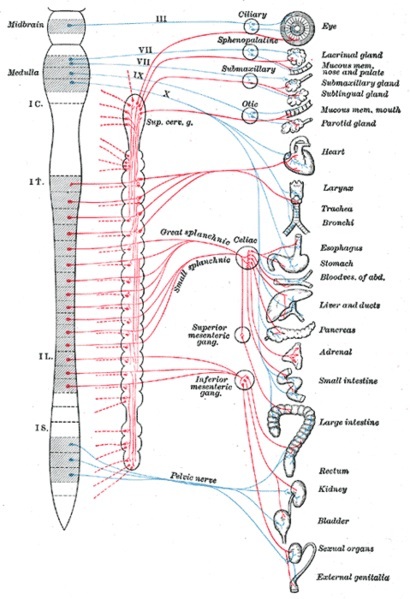 “Structure of the Autonomic Nervous System.” Boundless Anatomy and Physiology, Lumen, Available Here.